A simple multi-stage cache set around Holy Trinity parish church in Bledlow. The published coordinates are for handy parking and the start of your quest. 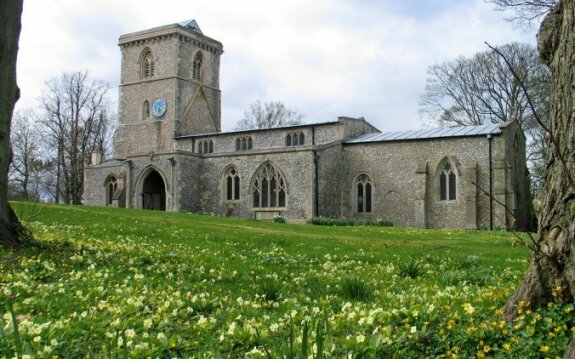 Holy Trinity is built of flint with dressings of limestone and a little clunch. The nave is thought to be part of an earlier 12th century church on the site, probably with transepts and a central tower. Aisles were added around 1200, and widened and lengthened later in the century, when the chancel was rebuilt on a larger scale, making it is wider than the nave, and the west tower was added. The south porch was built in the 14th century and windows were inserted in various parts of the church. In 1909 the whole building was restored. The tower now has eight bells; an Inventory in 1552 records 3 bells and the 1637 Visitation records 4 bells. In 1683 these were re-cast in Woodstock by Robert Keane. In 1842 a fifth bell was added, made by Taylors of Loughborough. In 1983 the church bell-ringers launched an appeal to mark the tercentenary of the founding of the first bells, the aim being to augment the peal to eight bells, and at the same time replace the 300 year old oak frame with a new steel frame. The south porch contains the oldest doors Buckinghamshire. The nave has six massive pillars of 1200, each with different foliage patterns at the top; the Norman font is in the Aylesbury style; and fragments of medieval paintings and 16th century texts are on the walls. The oldest object in the church is the font, which was carved in the Aylesbury style by two stonemasons sent over to do the work by the Abbot of St Albans in the 12th century. A small, square, roughly made recess on the south wall behind the font housed the holy oils used in Baptism. Now, onto the cache. Adjacent to the recommended parking is a wooden telegraph pole with a metal plate embossed with a large letter A and some numbers. What is the single digit immediately below the punched out zero? Let this be C.
Now make your way to the access gates at the southwest corner of the churchyard. These commemorate a Coronation, and give a date. Add the first digit and the last digit to give you B. Near the north west corner of the church building you will find Earth Point No 2. On the lightening conductor you will see a number of years stamped into the brass strip. The first (uppermost) of these is AA. As you make your way round the church, look up at the tower. On the outside of the walls you will see iron + shaped braces. Count the total number on the three easily visible faces of the tower to give you D.
Make your way back to the gate you entered by. On the verge just outside is a bench in memory of Annie. The final digit of the year she died will give you E. The third digit of the year she was born will give you F.
The checksum for these six digits is 26. You are looking for a small bison tube. Update 19 September 2015 - The cache has been moved a short distance and some of the values changed. If you collected values before this date please start again!